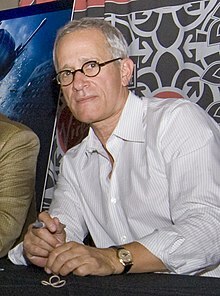 James Newton Howard (lahir di Los Angeles, California, 9 Juni 1951; umur 67 tahun) adalah musikus, komposer, konduktor, dan produser musik berkebangsaan Amerika Serikat. Dia telah mengerjakan komposisi lagu untuk lebih dari 100 film berbagai genre, menerima sejumlah penghargaan dan nominasi. Howard telah menerima satu penghargaan Grammy Award dan Emmy Award, serta delapan kali namanya masuk nominasi pada Academy Award. Namanya dikenal secara luas melalui komposisi musik untuk film antara lain Pretty Woman (1990), The Prince of Tides (1991), The Fugitive (1993), The Sixth Sense (1999), Treasure Planet (2002), The Village (2004), King Kong (2005), Batman Begins (2005), I Am Legend (2007), Blood Diamond (2006), The Dark Knight (2008), The Hunger Games (2012), The Bourne Legacy (2012), The Hunger Games: Catching Fire (2013), dan The Hunger Games: Mockingjay – Part 1. Sesekali dia berkolaborasi dengan sutradara M. Night Shyamalan, dan menghasilkan sembilan karya film sejak The Sixth Sense. Tahun 1982, Howard tampil dalam Toto IV sebagai konduktor string dan orkestra orchestrator untuk konser bertajuk I Won't Hold You Back, Afraid of Love, dan Lovers in the Night. Satu tahun kemudian, dia merilis live album berjudul James Newton Howard and Friends, yang menampilkan grup musik Toto; David Paich (keyboards), Steve Porcaro (keyboards), Jeff Porcaro (drums), dan Joe Porcaro (percussion). Tahun 1983, Howard bertindak selaku poruser, musisi (keyboards), dan orkestrator untuk album Riccardo Cocciante berjudul Sincerità. 1982 Toto IV Conductor/Orchestrator(Strings) for I Won't Hold You Back, Afraid of Love, and Lovers in the Night. 1983 James Newton Howard and Friends Recorded live, direct-to-disc. Features David Paich (keyboards), Steve Porcaro (keyboards), Jeff Porcaro (drums) and Joe Porcaro (percussion). TriStar Pictures Film scoring debut. Composed with Alan Howarth. First score by Howard to have an album release. Men various ABC TV series pilot and theme. Silver Screen Patterns III Cue "She Rescues Him Right Back" written by Thomas Pasatieri. Includes song co-written by Howard and performed by Barbra Streisand not used in the film. Academy Award Nominee for Best Original Score. American Heart Martin Bell Triton Pictures Independent film. The song "Look What Love Has Done" was nominated for an Academy Award and a Golden Globe. Imagine Entertainment ID N/A N/A Logo theme. The song "For the First Time" was nominated for an Academy Award and a Golden Globe. Nominated for the Academy Award in the category Best Original Musical or Comedy Score. 1998 From the Earth to the Moon various Home Box Office Score for part 6: "Mare Tranquilitatis"
Touchstone Television TV series theme. Winner of the Emmy Award for Outstanding Title Theme Music. Warner Bros. Composed with Hans Zimmer. Additonnal music by Blake Neely and Chris P. Bacon. Sony Pictures Animation ID N/A N/A Logo theme. Columbia Pictures Composed with Stuart Michael Thomas and Blake Neely. Miramax Films Soundtrack released by Hollywood Records as an iTunes exclusive. Composed with Clay Duncan and Stuart Michael Thomas. The Weinstein Company Soundtrack released by Varèse Sarabande. Overture Films Composed with Marty Davich. Warner Bros. Soundtrack released by Warner Bros. Records in one-disc and two-disc editions. Nominated for the Anthony Asquith Award for Film Music at the BAFTA Awards, shared with Hans Zimmer. Oscilloscope Pictures (US home video) Soundtrack released by Nonesuch with one score track. Wings Over the Rockies Tod Williams Holding Pictures Short film. Universal Pictures Some additional music with Hans Zimmer. Arc Productions Soundtrack released by Hollywood Records and Walt Disney Records. Composed with Chris P. Bacon. Pawn Sacrifice Edward Zwick Blecker Street Wide release on September 18, 2015. In May 2008 he was made an Honorary Member of the Royal Academy of Music. ^ a b c "James Newton Howard". Billboard. Diakses tanggal 2014-01-28. ^ "USC Thornton School of Music : About Us: Board of Advisors: James Newton Howard". Usc.edu. Diakses tanggal 2011-01-02. ^ "James Newton Howard – Elton John Story". Yamaha All Access on youtube.com. Diakses tanggal 2014-01-28. ^ Fowler, Lilly (February 19, 2009). "Family Secret, Persistent Bias Inspire Soul of 'Defiance' Score". Jews and Oscars. Jewish Journal. Diakses tanggal 2014-08-04. ^ "SoundtrackNet : News : James Newton Howard replaces Howard Shore on King Kong". Soundtrack.net. October 14, 2005. Diakses tanggal 2011-01-02. ^ "Bob Edwards Weekend @". Podcast.com. Diakses tanggal 2011-01-02. ^ "New Appointments". Royal Academy of Music. Diakses tanggal October 2, 2010. Wikimedia Commons memiliki media mengenai James Newton Howard. Halaman ini terakhir diubah pada 15 Juni 2018, pukul 08.43.